I grew up in the suburbs of DC, surrounded by whip-smart politicos, ranked military officers, and lobbyists. My friends were their children. At that time, it was the best public school system in the country. Anxiety and achievement were driven into us youngsters at birth. A year or so after my husband and I were married, we were visiting the area. I was showing him all of my old haunts. I also took him to my favorite park early Saturday morning. After we walked a few short trails, we came upon a family scene in a small playground. Perched at the tippy top of a sliding board was a little girl no more than three years old. Standing on the ground next to the slide was the little girl’s mother. In line behind the girl was her sister, probably five. The mother was holding her arm out in front of the little girl, blocking her descent until she could calculate a math problem. The little girl said something inaudible. It must have been the word “eight” because she was then permitted to go down the slide. The girl stumbled and wasn’t permitted to go down the slide. Several seconds passed. I held my breath, refraining from shouting the answer. Finally, the arm raised and the child went down the slide. I exhaled in relief. The drill continued for these two little girls as we continued our walk. For a moment, I had to dig a little deeper to see why he was asking me this question. I remembered that the very week before that, I was in my car, on my way to get a massage. And I was panicked. Close to tears. Why? Because I had been a “slacker” that week. I’d been scattered and unfocused. And as I was driving, I realized that I had not done anything to “deserve” my massage. I hadn’t lifted heavy or pushed my body to the limits. I hadn’t ticked off the 17 points on my 17-point to-do list. I hadn’t written anything perfect or completed a big project. In other words, I hadn’t EARNED a massage. I didn’t answer the math equation correctly, therefore I didn’t deserve the fun of going down the sliding board. Whether or not someone made you answer math questions before you could slide – or whether you ARE someone who makes kids answer math questions before they can slide – you are most likely someone who doesn’t necessarily feel comfortable with being, well, comfortable. And I don’t mean pampering. Pampering is nice. It implies sitting around in your pink puffy bathrobe and getting a pedicure. Pampering, however, is an activity. Entertaining ourselves in an activity. High-achievers? We can DO activity. We don’t have a problem with that! We have a problem with space, even with joy. Space and joy are more basic. 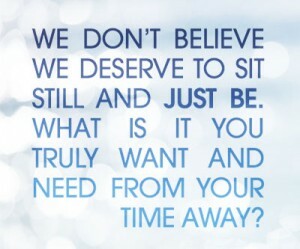 We don’t believe we deserve to sit still and just be. There’s always one more thing we could be doing. Always one more thing that might make us worthy. Always one more thing that we didn’t quite get done. Something else we need to be controlling, thinking about, obsessing on, or worrying over. THEN, we’ll deserve it. THEN we will have earned it. When you get ready for your next vacation, notice your thoughts. Sometimes our planning, our agenda-izing every single moment of our vacations is a military tactic to ensure our brains are occupied with at least one worthy activity – in this case, PLANNING! Sometimes we pack every last trashy book we can so we can stuff our brains with a shadow-deserving. “I deserve this trash! I’ve earned it!” We are the woman who has been on a celery diet for 3 months sitting down to stuff herself full of every kind of pizza at the buffet table. Filling herself up, yes. But never nurturing her true hunger. This is not to say that you shouldn’t make plans or that you shouldn’t read trashy books. It’s simply a reminder that you can give yourself the ecstasy of doing nothing too. The point is to give yourself a chance to desire – to truly desire – something. What is it you truly want and need from your downtime, your time away? Don’t forget to answer that. And remember – this isn’t math. There really isn’t a right answer. There’s simply letting your true voice speak. Happy Vacation and Anniversary! Can’t wait to read the rest! Such an important topic. I am working on ‘getting comfortable with happy’ thanks to your coaching. Step by step…. Wonderful article containing too many truisms. I am sitting in the Scottish Highlands looking at mountains with a long to do list, berating myself for not finishing my article because I wanted to read your piece…… Lots of unpicking and looking for space required methinks. For a long time, I felt I couldn’t go down the slide until I had ALL of the RIGHT answers! Now I know good enough is good enough. Great article! Wonderful Christine! Can’t wait for the whole book. It’s funny, but being able to sit around and do nothing is one of the things that drew me to my husband. It doesn’t come naturally to me, but he helps balance me out. And we are celebrating our 13th anniversary this weekend! Happy anniversary to you too! Outta the park on this one, Christine. Outta the park. Great. Keep writing, Christine! We need to hear this. I don’t even know what to do with myself on the rare occasion that I have ‘space.’ And yes, I typically feel I don’t deserve it – even when I know I’ve earned it! My husband and I went away for our 20th anniversary to a mountain retreat near VA/NC border and it took me two full days to get used to the nothingness…to STOP planning an outing or asking what we were going to do that day. Hope you are enjoying your nothingness! Christine, You are so very right about this . . . many years ago I struggled with this and realized we are all so programmed to believe that life and self-worth equals productivity – just because what we produce is the measurable. I stopped living that way and found that my times of solitude were so nurturing, and often inspiring to my work, that I would always make space for it, daily, if possible. And yet, STILL, the ‘deserving’ aspect comes up and baits me . . . I have recently come through a very, very demanding work phase where I’ve spent 2-1/2 months of long hours, crinking the muscles of my neck and shoulders into a thousand tight knots, all the while promising myself a lovely massage and spa day at the end of it . . . and now that things have lightened up a bit, I can’t bring myself to make the appointment and schedule it. Why? “because you’re not doing enough right now . . it will take a whole day . . , etc.” – just mindless nonsense. I’m calling right now! Your description of beating up on yourself for having a massage you somehow hadn’t ‘earned’ really hit home. Thanks for always having the exact right message for any particular day that I read your gifts – it’s wonderful, but you’re a little spooky that way!! And have a great vacation (another thing I’m having trouble scheduling – but I’ll just start with the massage, for now). Smiles, and lovely beach walks to you! Ouch, ouch, OUCH!!!! Oh my goodness, reading that article was painful 🙁 I didn’t reflect the ‘wacky mom’ part BUT the rest! I stopped between meetings at Panera and got a 1/2 salad/1/2 soup, I was stressed and wanted to treat myself. It was nearly $10!!!! I don’t deserve that expensive of a lunch!!! I actually thought that and almost drove thru w/out stopping. Mind you, I do work full time and am on overdrive with every aspect of running a house and raising two girls here and, and, and … but I was wacky enough to put that ‘deserve’ part in my mental conversation ((in truth, I’m probably wackier than that mom!!!)) All I can say is OUCH. Happy Anniversary! May your time away be restorative and quiet. I found myself shouting at the screen “I have DOWN TIME!” . . . which is usually filled with guilt 🙂 Thank you for this. Enjoy your holiday and your anniversary! You are at my favorite place to be! I’m putting myself through this nonsense right now. Sheesh! Last day before vacation and I’m beating myself up because I haven’t finsihed the “to-do’s” that I set out to finish. It’s really ok…those “to-do’s” will be there when I get back in town next week. Thanks for saving me, Christine! Enjoy your vacation and Happy Anniversary! Happy Anniversary and happy downtime. Sometimes I want vacation to charge me up with new experiences (e.g., vacation to someplace foreign) and new languages. Other time, when I want to veg, it’s Seven Mile Beach in Cayman. Nothing washes away stress like the ocean. It takes a couple days to wind down, but it’s one place I can really relax, release, relinquish! I love this! Excellent reminder that we need to take time and just BE. We need to give ourselves permission. Or sometimes, as in your message, we need someone else to give us that permission. A few years ago, someone gave me permission to “just be” on a retreat. Noble Silence! We were silent from bedtime to around 9 a.m. the next morning. No forced conversation at the breakfast table…yeah! Just a smile or a quiet acknowledgement to each other. Some of us were nudged out of their comfort zones by being quiet. Can you imagine? I’ve since incorporated this practice at all the retreats I have hosted. Only one person ever gave me “kick back” about the practice. I have discovered that sometimes the ones that fight the hardest against something are the ones that need it the most. Thanks for your continued inspiration Christine! And, your anniversary card is waiting for you at home. Perhaps practice “doing nothing” for brief moments throughout your day. Go outside and look up at the sky. Pause whenever you hug someone and just really feel that person. Whenever you notice you’re on your way somewhere or lost in a trance of thinking, stop just for a moment and come back to right here, right now. Happy Anniversary You <3-Birds! In Joy your beach time doing nothing! *In my down time I Love to sit on my porch and stare….. Thank you Christine for this!!! I often feel so guilty when I take down time. It is so hard for me to do nothing! I have just returned from our vacation at the family lake house. I packed 5 books! Really? What was I thinking? When we arrived, I was getting pressure from friends (who live up there in the summers) and my husband to golf and do this or that. All I wanted to do was be….on the lake, on the deck or on the beach. I took a stand with both and did quite a bit of nothing for the first few days. I cannot tell you the peace of mind I had. Heading back up tomorrow for more of the “nothing”. Thank you Christine! This is so timely right now! Kids home from school, tons of business projects and lists to complete… and I never seem to feel ready or deserving to stop… or I just stop and then feel like a failure. This is a beautiful reminder of the healthy perspective I choose to have. Thank you. Fabulous and right on target, as always, Christine! I see this dilemma so often in the health-seekers that work with me (and I recognize it in myself too!) Having grown up in the mountains of North Carolina myself, I know that the rhythm of life there when I was a kid supported lots of the spaciousness we all crave, but perhaps we didn’t know its value. Now that our lives tend to be overly scheduled, we are realizing that we have to create this spaciousness ourselves. And it starts by giving ourselves “permission” to do so… I can’t wait to read the rest of your book when it comes out! I hope that you savor every moment of your time away! At first glance I thought, that is not my problem, after reading the whole article I must say, it IS my problem. Please write on, Christine.